You are here: Home / Lifestyle / What Lessons Did YOU Learn This Year? The New Year is always my favorite time of year. Not because I go out partying and living it up (although, if I had the opportunity, I won’t lie–I’d be in the middle of that mosh pit. Just. Sayin’). This time of year is my favorite because I love looking back on the last 365 days, and I get excited for what lies ahead for the next 365 to come! Most bloggers around this time are reflecting on “Projects Past,” (e.g. My Top 10 Posts of 2016!) and while it’s a great idea, let’s go a bit deeper. Let’s talk about what each of these months actually meant. What were the important lessons? I think projects are more than just projects. And DIY is more than just DIY. It’s about creativity…problem-solving…therapy (hello!! Don’t you feel better after working on a project??) LOL. So let’s take a walk back through 2016 and highlight some of the important lessons learned, both big and small. New Year’s Eve today marks the One Year Anniversary of my grandmother’s passing. So in January while everyone was ringing in the New Year, ready for a fresh start, my family was planning the funeral arrangements for my grandmother. And while I’ve been fine this year, my mom has really suffered through the loss. She was her primary caregiver, during a time when people who she’d thought would be there to help ended up not helping. The burden was too much to bear for her at times. 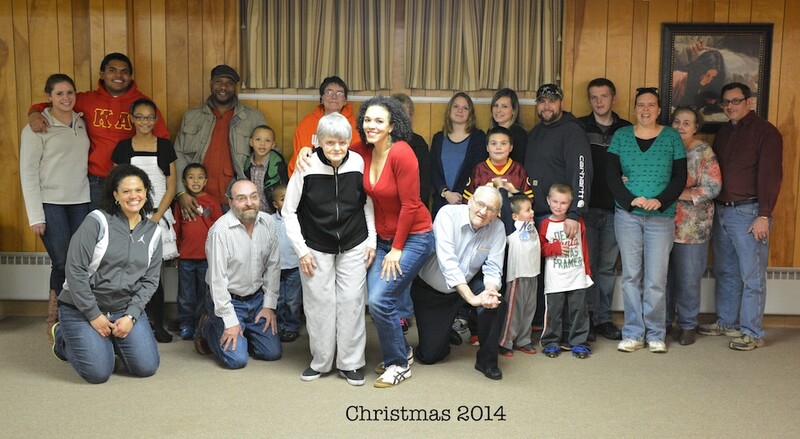 What my mom taught me was the importance of never turning your back on family even when things were tough. 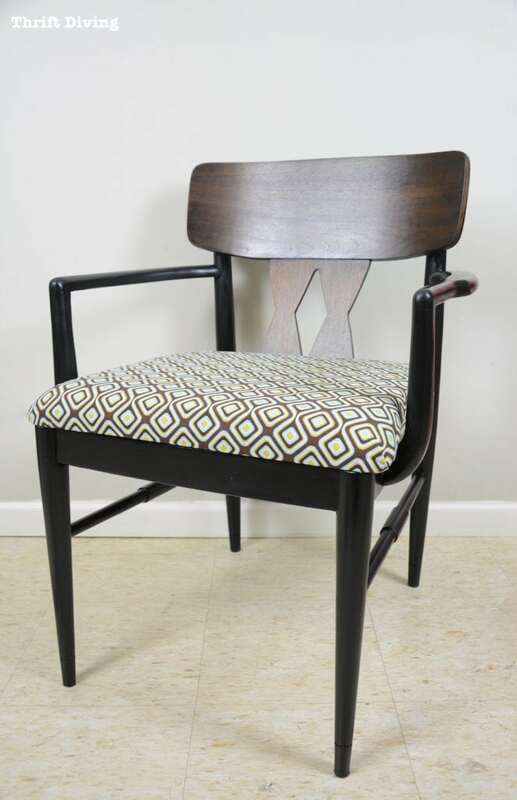 In February, I attempted to make over a mid-century modern chair makeover that almost ended horribly! Remember?? I’m laughing just thinking about that horrible sanding job I did! I ended up salvaging it, but the lesson learned is that even if you mess something up, it doesn’t mean you ruined it. And, in the essence of Tim Gunn, make it work. Lesson Learned #3: My Readers Got My Back! 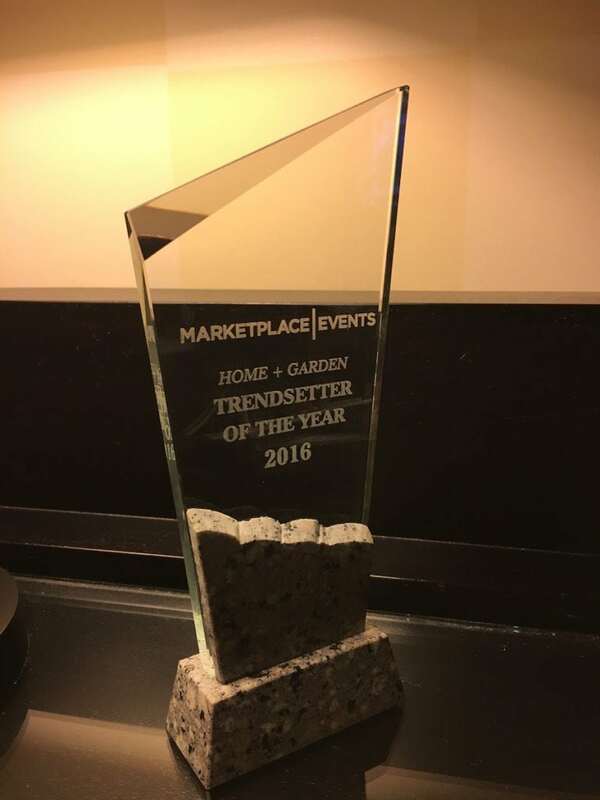 Remember how I emailed some of you daily back in March, asking for your vote for the Home + Garden Trendsetter of the Year voting? The voting was for this contest I entered where myself and two other bloggers were in the running for the Trendsetter Award. 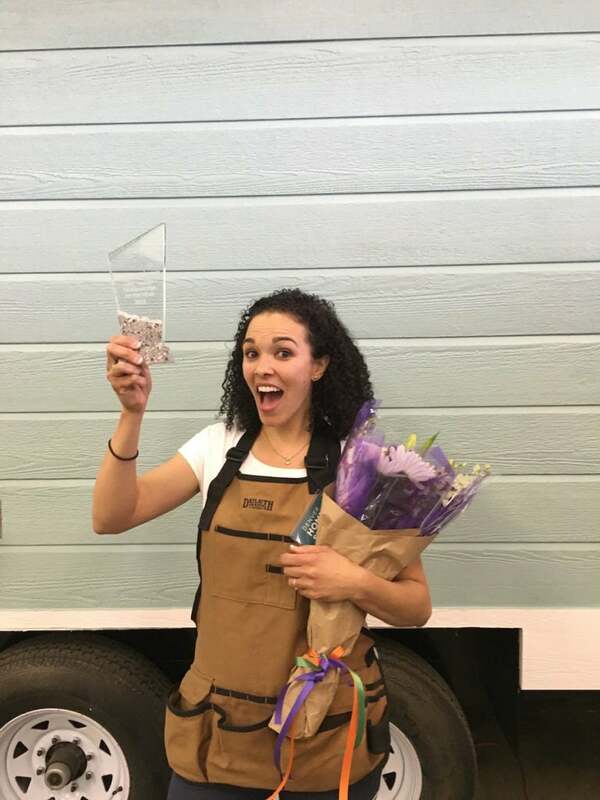 It was basically something that the Home Show people started doing, which would allow the winner to travel to several home shows and do on-stage presentations. There would be some opportunity for media coverage (e.g. local TV news) and what-not. Well, let me tell you… We blew the competition out of the water! You guys voted every single day…you set reminders on your phone to vote daily so you didn’t forget. And you rallied right beside me! It felt like we instead of me. What I learned is that my readers got my back! You guys appreciate what I do and what I offer on my blog. So when I needed a favor–your vote–you made it happen! 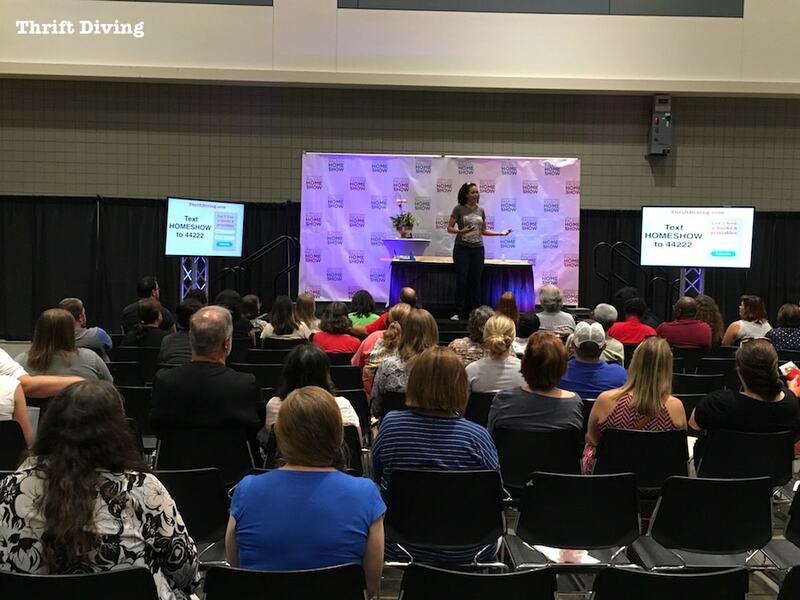 As a result, I got to present at several home shows, such as Jacksonville, Florida; Raleigh, North Carolina; and Kansas City. The other lesson I learned is that presenting is something I do very well. And if it weren’t for you readers, I never would have discovered that about myself. In April, I decided that I would start highlighting some of my favorite readers. Thus, the “Reader of the Month” was born. And you guys loved it! 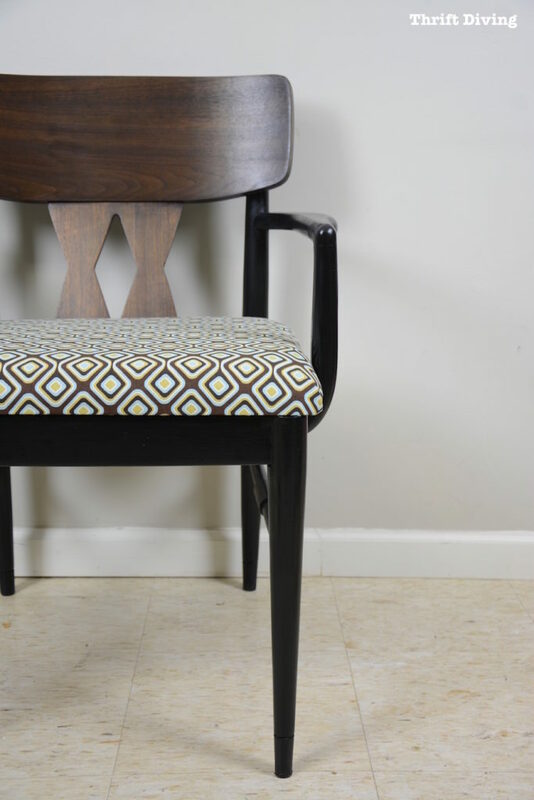 I wasn’t sure how people would respond to it because it wasn’t a DIY project–gasp! 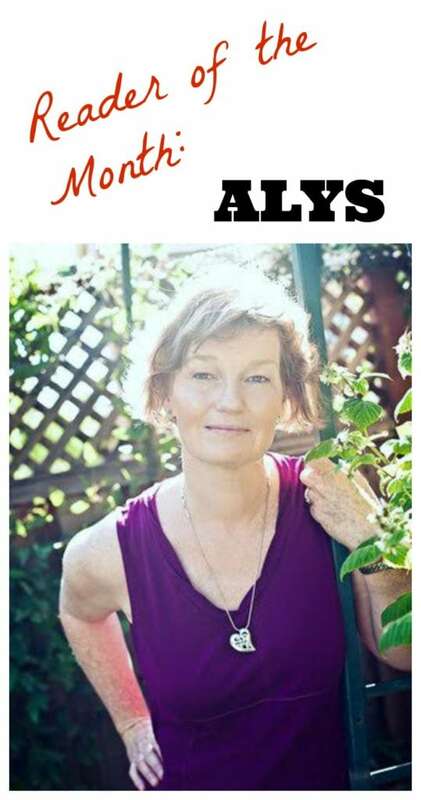 People left comments to tell Alys, my first reader of the month, that she was great and appreciated in our Thrift Diving community! And that was amazing! I’m sorry that as life and projects have gotten busy at times, I haven’t done the monthly feature regularly. However, for 2017, I plan to do it often. 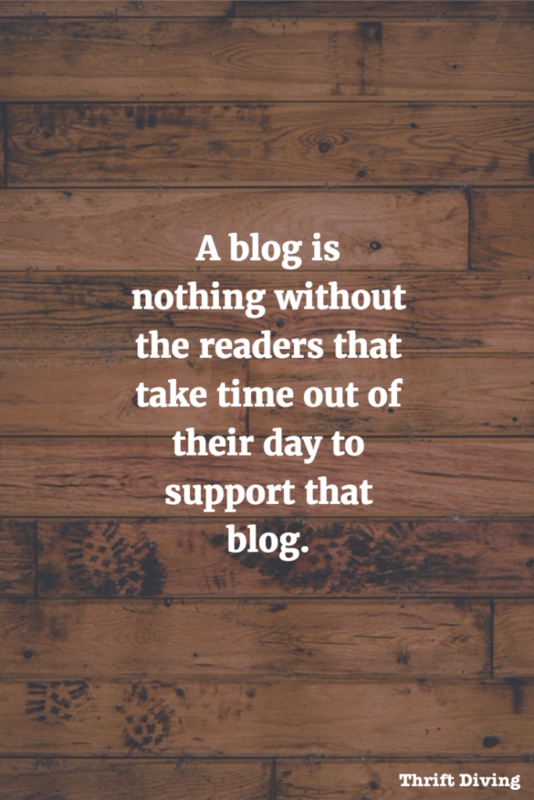 What I learned is that the people that come to this blog are even more important than the one crafting the posts. 🙂 Because without readers, this would only be a journal. Lesson Learned #5: Tung Oil is Magical! 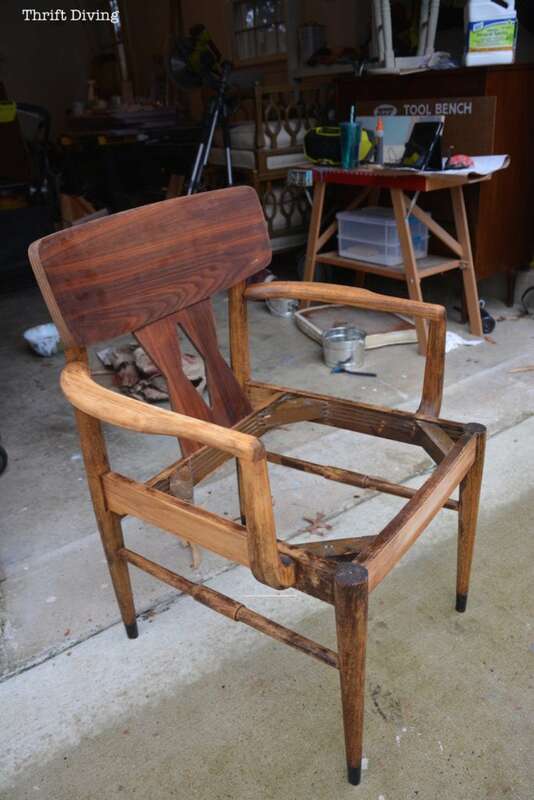 In May, I tried a product called tung oil, which gives wood a wet look. I had used it once before, but the results weren’t as dramatic as this! A reader here had recommended it and one day I just decided to try it out. 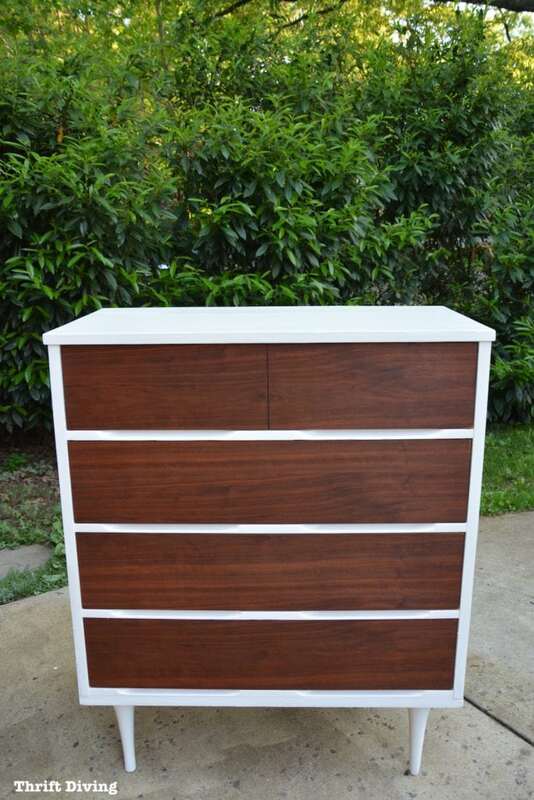 I had this thrifted mid-century modern dresser that was one step away from being re-donated back to the thrift store, but at the last minute, decided to see if I could make it beautiful again. Well, after a coat of white paint on the body, I sanded the drawers and added some tung oil to the bare wood. And oh-my-goodness. That wood came alive like nothing I’d ever seen before! 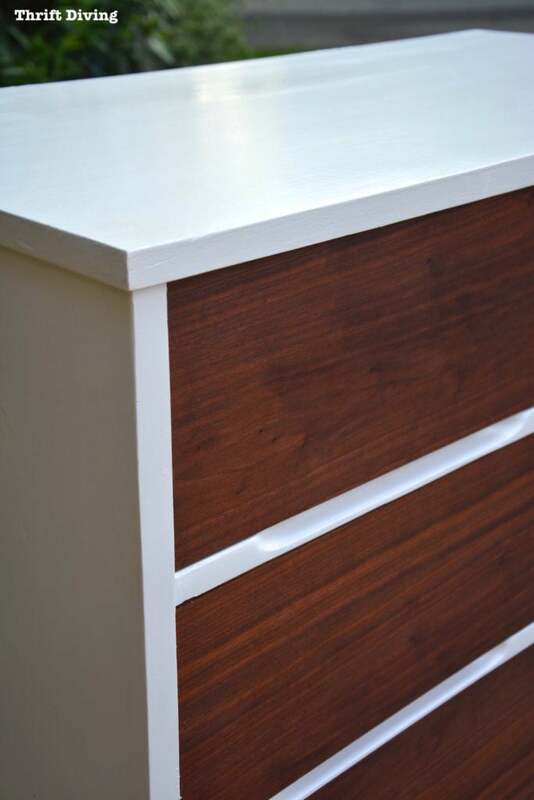 What started as dull, scratched drawers, suddenly became the richest wood I had ever seen! 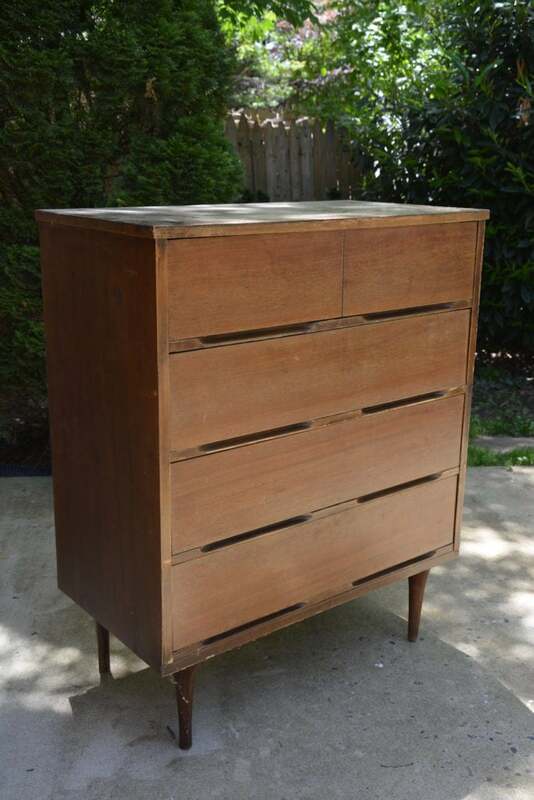 And the crazy thing is that the drawers had no stain. I had simply sanded them down and applied the tung oil. And the result was magical. The lesson learned was that not all wood should be painted. Sometimes the magic of tung oil can bring out the beauty in wood! One thing you probably don’t know about me is that I’m scared of dark colors. Not scared as in break out in night sweats. HA! 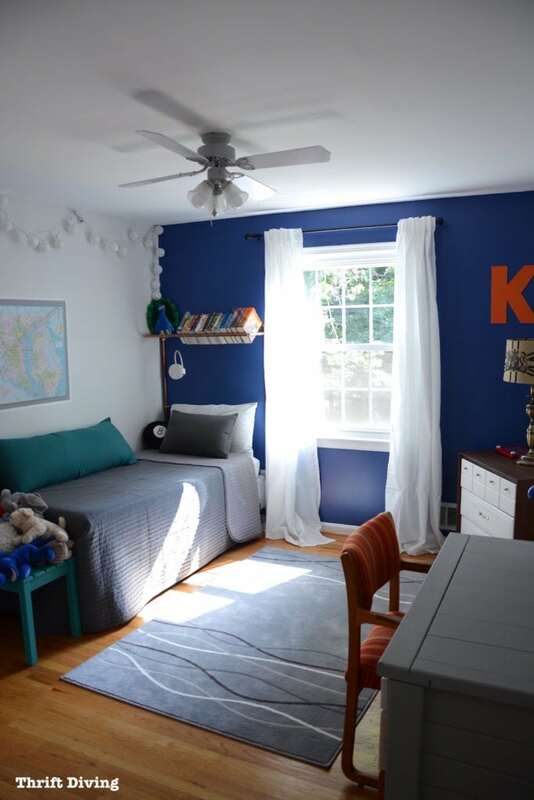 But in June, I tackled my oldest son’s bedroom as part of the Home Depot DIY Challenge, where they assign you a special material and you have to make a project from it. I decided to make a DIY copper headboard. 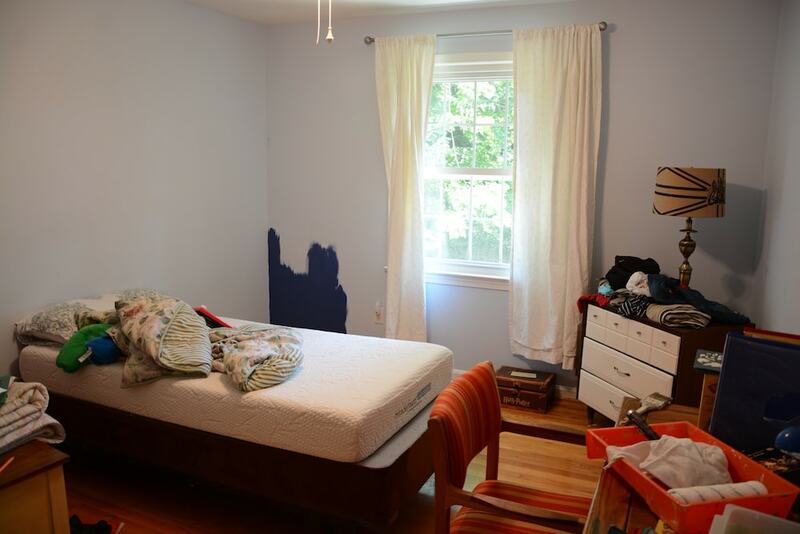 And what started as a boring room suddenly came to life with a royal blue paint! I absolutely loved it! Didn’t even make the room too dark, either, since it was an accent wall! The lesson I learned is that sometimes we have to go outside of our comfort zone because we might surprise ourselves. Lesson Learned #7: Gardening is Grueling! 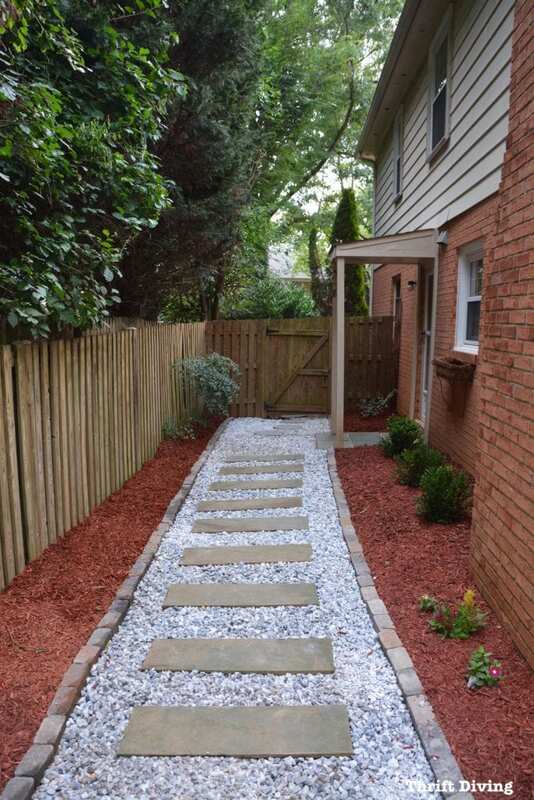 In July, it was all about the Outdoor Overhaul Patio Makeover Challenge with RYOBI Landscapes! 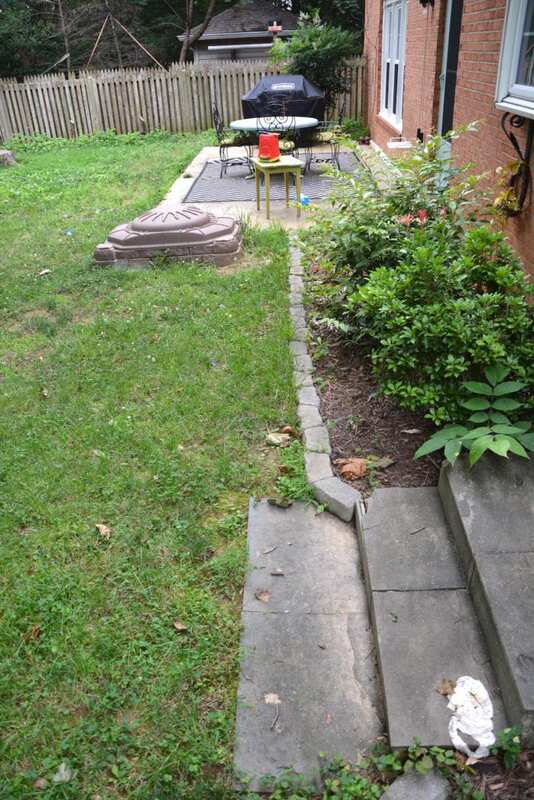 It was the dead of summer, 100 degree days, and what was supposed to be a simple, “Hey-I’m-going-to-just-pretty-up-my-patio!” ended up turning into a “dig-everything-up” type of project! I didn’t mean for it turn into such a big project, but isn’t that usually how it goes? Start small, end big. HA! 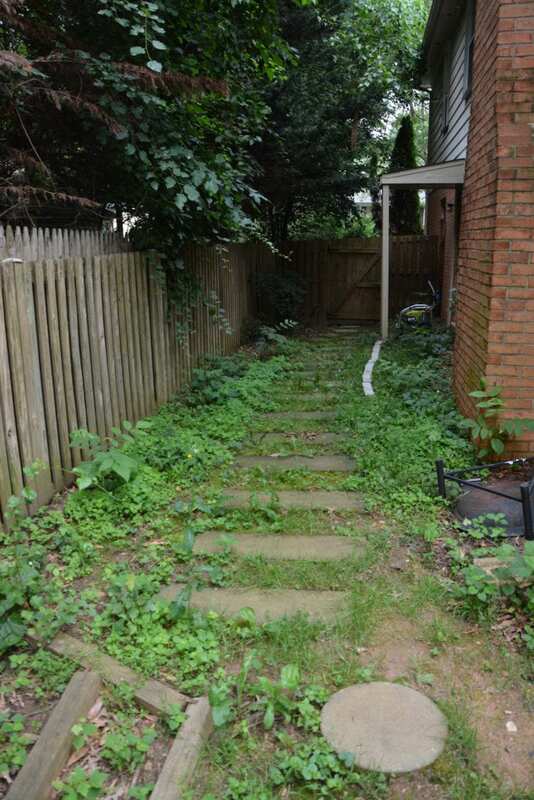 Before I knew it, I was de-weeding the whole perimeter of the house and creating walkways, which I had never done before! What I learned is that gardening and landscaping is hard work. But they’re one of the most satisfying jobs! I haven’t felt insecure about my body in a long time. I mean, we all have moments where we wish we were thinner, taller, more this…more that. When I was a kid, around 5th grade, I remember looking in the mirror and crying because I hated the way I looked. My hips were starting to fill out and I often wore long shirts to cover them up. I had this short Afro that made me look like a boy. Yet, I yearned for long, silk hair like my classmates, not short, curly hair. As an adult, though, I’ve never felt more confident, even despite carrying more weight after bearing three boys. I really thought I had outgrown any insecurities since it had been such a long time since feeling so awkward. But it wasn’t until August when I was invited to film a national TV commercial for Duluth Trading Company that I really felt insecure and out of place. I was the largest of the three models, and I just felt heavy and….well….fat. By the time the week was over, though, I had learned that even though I was bigger than the other models, I was strong. I was healthy. And I still fit in. But I also learned that even at nearly 40, I could still feel insecure. Well, this isn’t really a lesson learned, because I already knew that inspiring people makes me happy! But in September, things were a little different. Normally, if I inspire people, it’s from behind my computer screen. However, September marked the month of my first home show after winning the Trendsetter award. Those were the moments that were the greatest joy about doing home shows–those moments where I can actually see the excitement in people’s faces after realizing that DIY isn’t as hard as they thought! 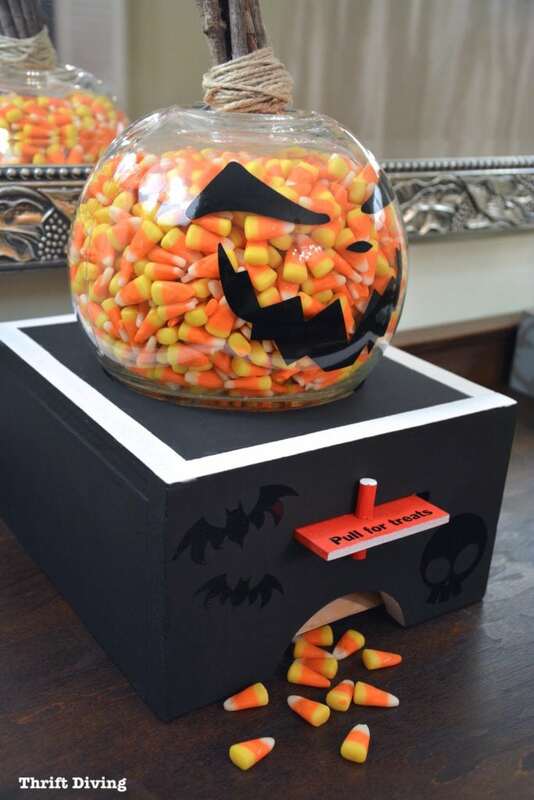 In October, I told RYOBI that I was going to make a “DIY candy dispenser” and would upload it to their RYOBI Nation site. Since a candy dish had already been build on RYOBI Nation before, I wanted something a bit more creative. 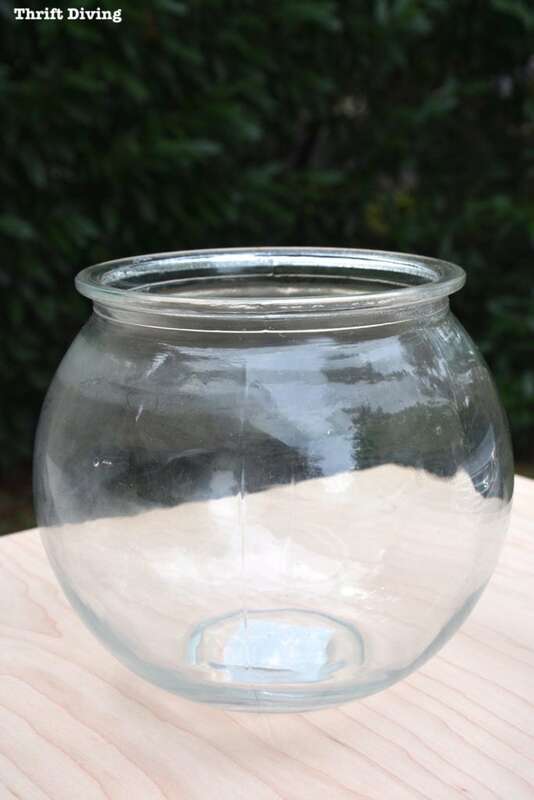 That’s when I decided I would turn a thrifted fish bowl into a pumpkin candy dispenser! The funny part is that I had no idea how I was going to do it! I visualized in my mind what needed to happen in order to get candy to come out, and then I just created parts for the inside to make it happen. I learned that DIY is simply about ingenuity–being clever, original, and inventive. In November, readers and I tackled our 30-Day Naughty November Room Makeover Challenge. Here on the blog, we try to do about two challenges a year, which is great for motivation for getting rooms decluttered, painted, and renovated! I decided I was going to try to build my own DIY bathroom vanity. Which was a little insane since I’ve never been known as a builder, per se. My reputation has always much more as a thrifter and furniture painter. But the love of power tools and woodworking blossomed in me this month. As I pieced together slabs of solid oak, this hodge-podge of solid oak has started to resemble a real bathroom vanity! Yes! LOL….I’m still scared because it’s not done and I worry about the imperfections and whether it will look good. I worry that down the road it won’t withstand our daily use and it will crack, split, bow–basically, fall apart on me. (NOTE: I’ve just learned that the moisture content in the bathroom, along with the seasons, will cause the wood to expand and retract, and I’m scared as heck that somewhere in that process all my screws will pop out! EEK!). As of yesterday, this is what the DIY vanity looked like. My friend Edmundo came over to test fit the white/gray granite top. We made some markings and there are some trimmings that I need to do for the sinks to fit. I’m excited to see it take shape! One thing that bring me a lot of joy in life is learning. I freakin’ love to learn new things! Especially when it relates to anything creative. Over the years, I’ve learned oil painting, knitting, pottery, you name it. 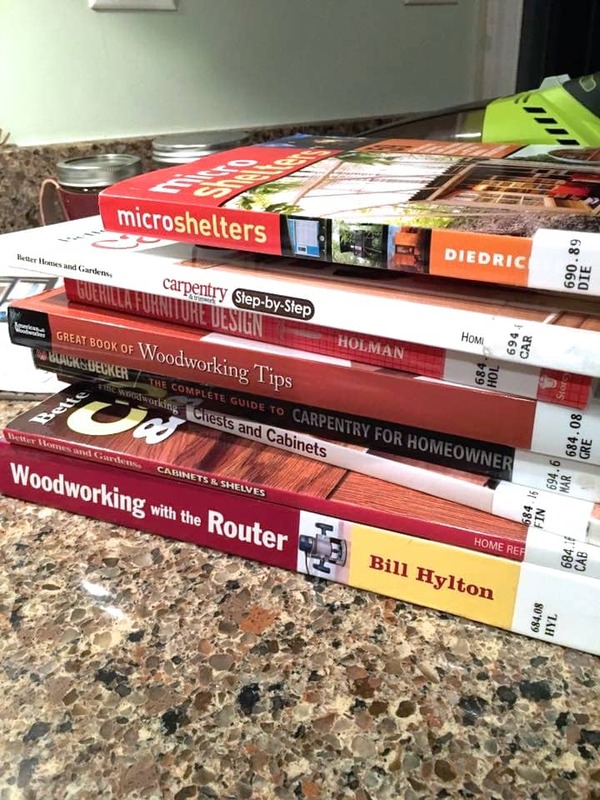 I’ve always wanted to learn carpentry and woodworking. 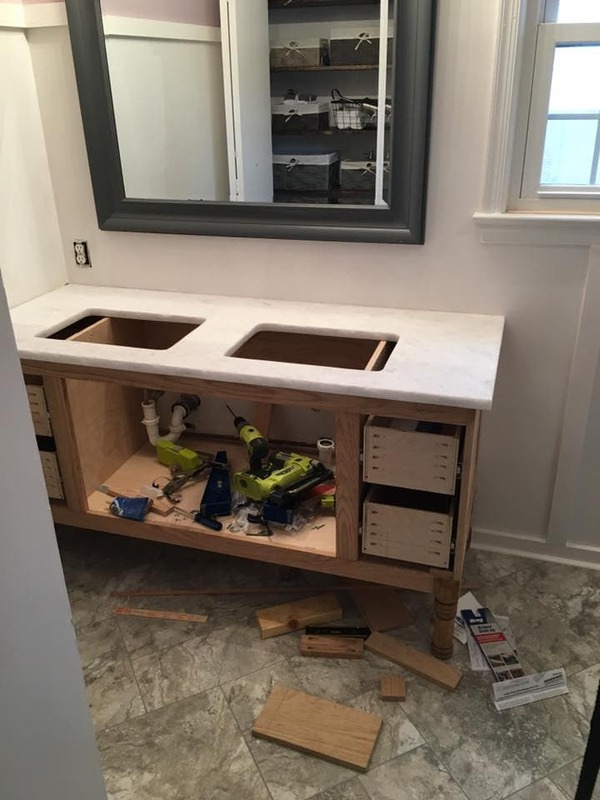 This bathroom vanity has taught me many things that I didn’t know, such as hidden tape measure tricks, how to drill holes for cabinet hinges, how to install drawer slides, and more. This month, I’ve wanted nothing more than to soak up as much as I can about these topics that I love. In fact, I’ve gone to the library and stocked up on good reads for the month of January. Because I have learned that you should never stop learning. It’s the essence of life. And as I hit PUBLISH on this post with just hours left until 2017 strikes, I’m excited for what’s to come in 2017! I want to thank each and every one of you for coming here to read these words, to follow along on my projects and endeavors. It means so much! 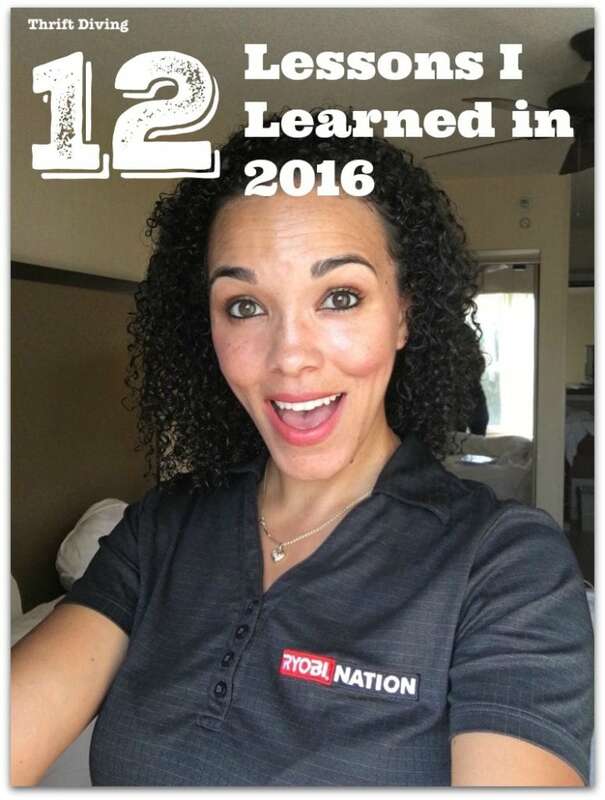 What lessons have YOU learned in 2016?? Leave a comment below and let’s reflect! Really feel blessed to implement them in real. one lesson I have learned and would like to add here is great health, take the right blend of fruits to live a healthy life, remember health is first wealth. Great lessons! I must have missed your pumpkin candy bowl project. So cute! I learned not to rush decisions. 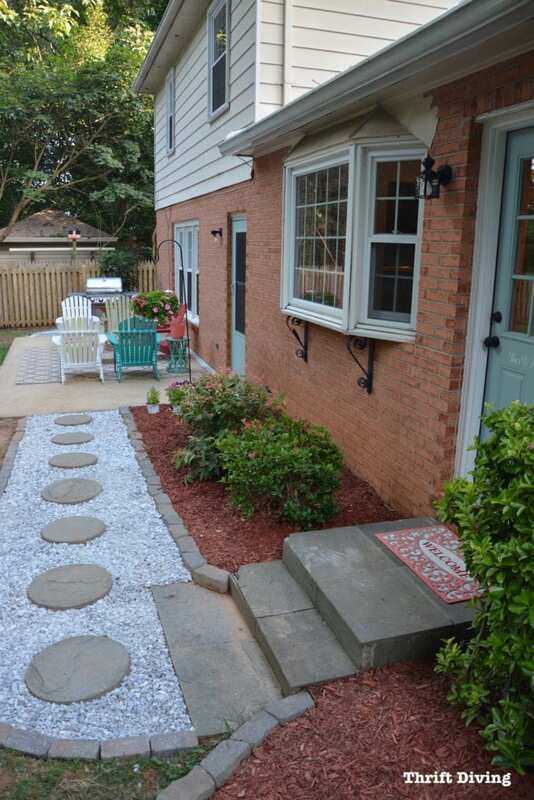 There are a couple things we did with our house right away when we moved in and I’m already wishing we had waited a little before we decided on them.